FILE - Civilians gather to look at the dead body of an unidentified man killed during fighting between the army and militia fighters in Beni, eastern Democratic Republic of the Congo, June 22, 2017. In a scathing report to the U.N. Human Rights Council, a senior U.N. official accuses the Democratic Republic of Congo of turning a blind eye to systematic and gross violations of human rights committed by its security forces. The report describes a justice system that shows no independence and allows impunity to flourish, leading to further violence against the people of Democratic Republic of Congo. In her presentation to the Council, U.N. Deputy High Commissioner for Human Rights, Kate Gilmore criticized the government of President Joseph Kabila for failing to live up to an agreement to pave the way for presidential elections this year and a peaceful transfer of power. 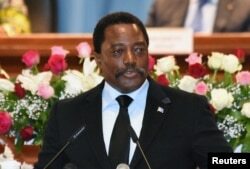 FILE - Democratic Republic of Congo's President Joseph Kabila addresses the nation at Palais du Peuple in Kinshasa, Democratic Republic of Congo, April 5, 2017. Instead of showing greater respect for human rights and freedom of expression, she says the government has become more repressive. “What followed was a general ban on the activities of the opposition and on the activities of civil society. What followed was continued targeting of political opponents, of human rights defenders and of journalists — relentless targeting,” she said. FILE - Congolese police detain protesters demanding that President Joseph Kabila leave power by the end of the year in Kinshasa, Democratic Republic of Congo, July 31, 2017. Gilmore says insecurity has increased across the country. She says violence has erupted in North and South Kivu and Tanganyika and in the southern provinces of the Kasai region on a scale not seen for many years. “As a consequence of the country’s conflicts, there are scattered across the Democratic Republic of Congo a staggering 3.8 million Internally Displaced Persons — the highest number in all of Africa,” she said. 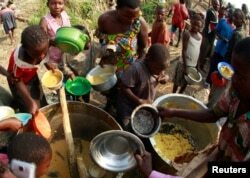 FILE - Congolese refugees, displaced by fighting between the Congo army and rebel group Allied Democratic Forces (ADF) last week, gather to collect food at the Bukanga transit camp in Bundibugyo town camp, 376km (238 miles) southwest of Kampala, July 17, 2013. Earlier this year, the U.N.’s call for an international investigation into widespread human rights violations, including 42 mass graves in the Kasai region, was rejected by the DRC. 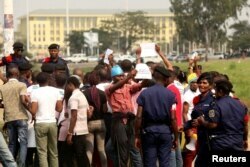 In what appears to be a turnabout, the DRC’s Minister of Human Rights, Marie-Ange Mushobekwa, told the Council her government would welcome investigations in the Kasai region by the international team of experts appointed by the Council.